Any economist will tell you that failing to integrate half of a country’s population into the workforce is economic nonsense — a needless expense that permanently limits growth and prospects for innovation. The IMF estimates that workforce gender discrimination costs the global economy almost $1.6 trillion annually. The economic damage inflicted by excluding women will only grow as the world ages, introducing demographic pressures that will make the need for continued growth and innovation even more urgent. The Asia-Pacific, increasingly the world’s economic and demographic center of gravity, will likely be the primary battleground where sustainable development and evolving demography will be balanced. Unfortunately, Asia’s two largest economies, China and Japan, are already suffering from needless constraints on growth due to workforce gender discrimination. Japan has fought market doldrums for two decades, suffering through not only persistently anemic growth, but also persistently poor gender economics. Since 1990, workforce participation rates among women have stagnated at about 50 percent. Worse yet is the rate of women in private-sector leadership positions. Only 9 percent of Japanese management positions are held by women, compared to 31 percent in Singapore. For one of the world’s most modern economies, Japan has long been held back by strikingly anachronistic gender norms. But Japan is moving in the right direction. As a part of his efforts to revive economic growth, Prime Minister Shinzo Abe has pushed a legislative program designed not only to encourage companies to hire more women and bring them into leadership positions, but also to expand access to child care services so women are less likely to permanently drop out of the workforce upon having children. Abe’s “womenomics” seeks to create the right progressive incentives to move cultural gender norms in the same progressive direction. The logic behind Abe’s effort is clear. Japan already has the world’s oldest population. To continue to support its retirees, Japan’s workforce will necessarily have to grow. 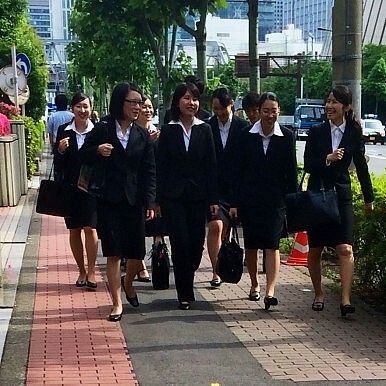 Luckily, Japan is home to a large population of underutilized, highly-educated female workers. In a report last year, Goldman Sachs estimated that closing Japan’s gender gap would grow GDP by nearly 13 percent. China, however, is in many ways Japan’s mirror image. Though China has a far deeper and all-too-recent history of rural poverty compared to Japan, Chinese women have enjoyed relatively better access to the labor market. Likely benefiting in part from China’s (otherwise-immiserating) decades of collectivist economics, Chinese women have seen much higher rates of workforce participation than Japanese women — at times by a margin of 30 percent or more. Yet though China’s economy has grown with tremendous speed since its reforms and opening up in the 1990s, the status of women has in many ways gone in the wrong direction. Workforce participation has fallen precipitously since 1990 — by about 10 percent — while assumptions around traditional gender roles have reasserted themselves. Chinese women speak not only of a “glass ceiling,” but a “sticky floor,” abetting a corporate culture where the share of women on corporate boards is less than half that of the United States and nearly identical to India, which has enjoyed far more modest growth over the same period. Even worse, these retrograde gender politics have become enshrined in party doctrine and even law. China’s topmost governing body, the Politburo Standing Committee, has never in history had a woman serve among its seven members. As recently as 2011, the Communist Party ran official media advertisements warning that those who delayed marriage for education or their careers were in danger of becoming “leftover women,” doomed to be permanently alone. Laws governing retirement and pensions are also disturbingly sexist, typically requiring men to retire at age 60 while pushing women to retire as early as 50 to accommodate their expected role in caregiving. But like Japan, China cannot afford a resurgence of outdated gender politics. China’s economy already appears to be shifting into a permanently lower gear, a concern for Communist Party leaders that would only be worsened by pushing more women out of the workforce. Moreover, China may soon face the same demographic pressures burdening Japan. Despite China’s recent decision to end its one-child policy, demographers do not expect many Chinese to take up the economic burden of a second child — leaving its workforce to shrink significantly in coming years. China needs a larger workforce as much as Japan does, and yet it is increasingly pushing women out of it. Though Japan and China both need to expand their workforces to maintain economic growth, their policy divergences are striking. Japan has seen modest gains over the last year as it embarks on its “womenomics” reforms, while China’s retrograde gender politics worsen as its rate of growth continues to decline. As the global economic center of gravity continues to swing toward the Asia-Pacific, the region and world are counting on policymakers there to get this right. Harry Krejsa is a specialist in Asia-Pacific security and economics at the Center for a New American Security. Maryam Janani is an international development strategy consultant with a focus on economics and gender. Follow them on Twitter @harrykrejsa and @mzjanani. Will developing Asia get old before it gets rich?